After years of warning, the Emerald Ash Borer beetle, or EAB for short, has been officially reported here in Omaha, Nebraska. 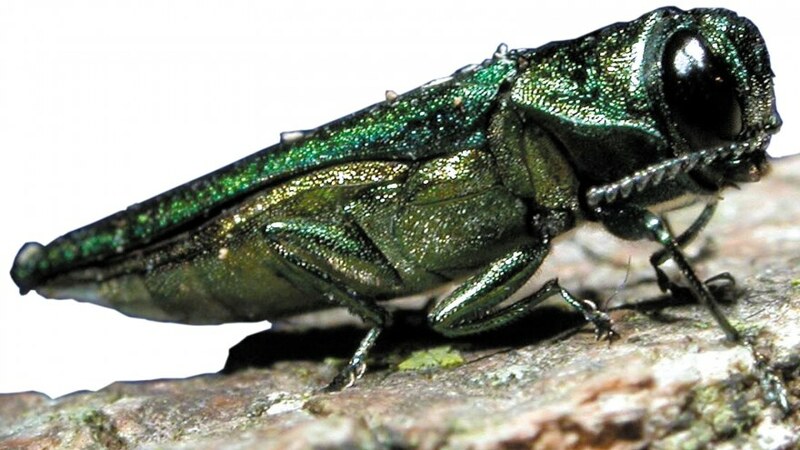 Unfortunately, this unwelcome guest will start killing the 44 million ash trees in the Omaha and surrounding communities, as it has done in other communities in the Midwest. We want to set the record straight, on this and other pressing facts about the EAB. We want you to be able to protect your beloved trees in the most informed way possible. Is the Emerald Ash Borer in Nebraska yet? Yes. Mayor Jean Stothert and The U.S. Department of Agriculture confirmed on June 8, 2016 that Emerald Ash Borer has been found in ash trees removed from Pulaski Park at 40th & G Street. You can check the Nebraska Department of Agriculture press release or Mayor Stothert’s website if you are concerned about an outbreak. What is the Emerald Ash Borer anyway? The Emerald Ash Borer is an Asian beetle that arrived in the United States around 2002, probably via wood shipped from Asia. It is small (1/2 inch long as an adult), and bright metallic green in color. The larvae are white, grow up to an inch, and are found in S-shaped grooves underneath the bark of the tree trunks of its victims. EAB lays its eggs in tree trunks, where the larvae grow, creating huge patterns of the S-shaped patterns mentioned earlier. These grooves disrupt the flow of nature, nutrients that the tree needs, and can ultimately kill a fully grown ash tree. Unlike other boring insects that typically target only unhealthy trees, EAB will target a completely healthy ash and can kill it within 2 to 4 years. How do I tell if I have it? If you are worried your ash trees may be infected with the Emerald Ash Borer, look for these symptoms: galleries of S-shaped grooves underneath the bark, cracks and splits in the bark, death of the upper canopy of the tree, D-shaped exit holes in the bark, and water sprout growth around the trunk. These beetles only target ash trees, so if you’re seeing signs in something other than an ash, it is not EAB. Short answer: Yes, but… Long answer: Yes, there are ways to protect ash trees from EAB. Chemicals can be injected into the tree by boring into the bark, or chemicals can be put around the tree. However, these are not magic solutions. The homeowner option, a chemical soil drench around the base of the tree. This is not adequate to protect larger ash trees. This can also damage other plants in the area as well as bees and other pollinators. Tree injections, must be done every 2 to 3 years. Drilling a hole into your tree puts it at risk for fungi or pests, and breaks through barriers meant to protect your tree from internal decay. Unless you know EAB is in the area (and, again, it’s not in Nebraska yet), it’s best to avoid injections. If EAB was in the area, the point to protect a tree is when it’s been detected within 15 miles. This gives your tree protection while minimizing harm to the surrounding area. The best trees to protect are the healthy, beautiful ash trees that you value the most. If not, consider planting different types of trees, to take the place of your ash in case something happens. Can I spray my own tree? Can an infected tree be saved? If EAB infects a tree, there is a chance to save it. If the infestation has been caught early, the tree can be treated, even if there is significant canopy damage. However, time is of the essence in this case, because trees over 50 percent damaged are much less likely to recover, as are trees that were already damaged or unhealthy. Yes! EAB spreads mostly because of humans. Moving infested firewood and nursery stock is the leading cause. To prevent the spread, moving firewood and nursery stock out of infested areas is regulated by state and federal quarantines. Avoid spreading EAB and other wood-infesting pests by purchasing firewood where you will burn it. Don’t bring wood with you when you travel. Leave unburned wood at the camp site. If you think you have EAB, contact the Nebraska Department of Agriculture. 402-471-2351 or the national EAB hotline at 866-322-4513.
class="post-template-default single single-post postid-1301 single-format-standard samba_theme samba_left_nav samba_left_align samba_responsive wpb-js-composer js-comp-ver-5.0 vc_responsive"